On the way to check-out this morning, I ran into MPR's Euan Kerr and Minnesota Orchestra board chair Warren Mack in the lobby, and we had the same discussion everyone else was having: how can we possibly communicate what this tour has meant to us all? Sam Bergman made such a good stab at it, writing from 40,000 feet, that I thought I would call it a wrap. Still, writers being what they are, I can't help but give my last two pesos. The beautiful serendipity of this trip is that every single person involved hungered for something — Cubans and Americans both — and in the last five days, a desperate need was met. I got into a sort of friendly competition with the woman who cleaned my room during my stay. Once I tried out my terrible Spanish on her, we shared a few sentences every time we met. I gave her an orchestra pin, one of the friendship gifts the musicians handed out throughout the week, and came back to the room later to find a kind note on my bed thanking me. The next day, I handed her a flyer advertising our Saturday concert when I ran into her in the hallway, and told her I hoped she could come. "It's very expensive," she said. "No, not so much," I told her, since we had heard that the ticket price was kept low for Cubans. Well, this nagged at me all day, so I went to the front desk and left a little bit of money with her name on it to be delivered to her. Sunday morning when I came back from breakfast there was a small wooden cigar box souvenir on my bed. Counter-attack! When I saw her in the hallway later, she thanked me and said by the time she could get off of work, she had no time to make it to the performance. 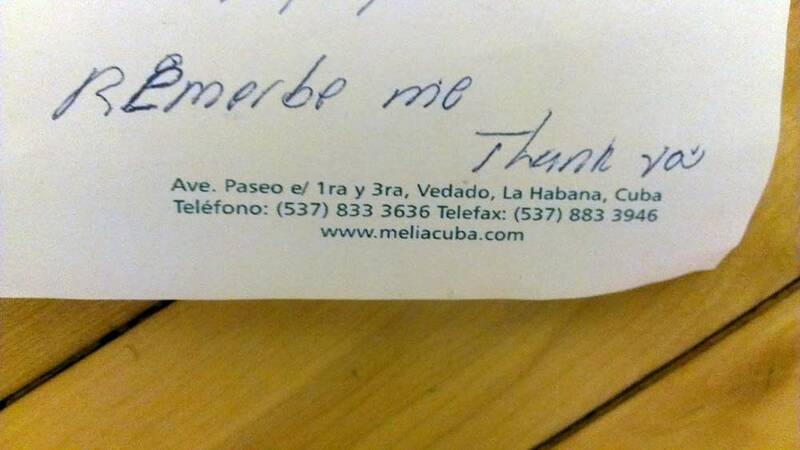 "I will leave my address and phone number, so if you come back to Cuba, you can find me," she said, and we exchanged tearful goodbyes in the Cuban fashion: never "adios," but "hasta la vista." See you later, until we meet again. On my final sweep of my room before checking out, in its customary spot, there was a note with her phone number, address, and directions to her house. At the bottom, "Remember me." How can we ever forget? Rena Kraut played in the clarinet section during the Minnesota Orchestra's tour of Cuba, and she wrote about her experience for Classical MPR.